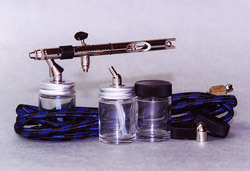 Badger Airbrush for over 45 years, the Badger Airbrush Co. has been producing high quality and reliable airbrush systems for fine artists, crafters, and hobbyists. Each Badger airbrush is made to exacting standards, assembled and tested by hand to ensure a premium finished product. Badger prides themselves on being leading innovators in the airbrush field, and now you too can discover the beauty and durability of these fine art tools with Badger airbrushes and equipment! Badger airbrushes offer high qualityand for great value. Badger airbrush sets help anyone to start painting with an airbrush. Badger Airbrush Set can be found for a 100$, Badger HD Needle is around 5$ a peace, XF Head Assembly is around 10$. Patriot Airbrush dual action,from Badger internal mix, gravity feed airbrush has a single needle and single tip configuration so no part changes are required. It has a 1/3 Ounce permanently mounted color cup with cap. The Patriot is a low maintenance airbrush, easy to clean and simple to change colors ans will spray any properly reduced paint or airbrush-ready media. Designed to deliver precise performance and fine line detail, it is ideal for all types of custom art, graphic arts and illustrative work. This airbrush will operate at lower pressure settings, 10-15PSI, and is ergonomically balanced for hours of comfortable airbrushing. Extra needle and tip in sturdy plastic hinged storage case. This is the Universal Model 360 Airbrush Set from Badger. Single size nozzle/needle design for spraying all materials. Correct weight apportionment balance system. Ultra comfort, ergonomically correct trigger cushion.